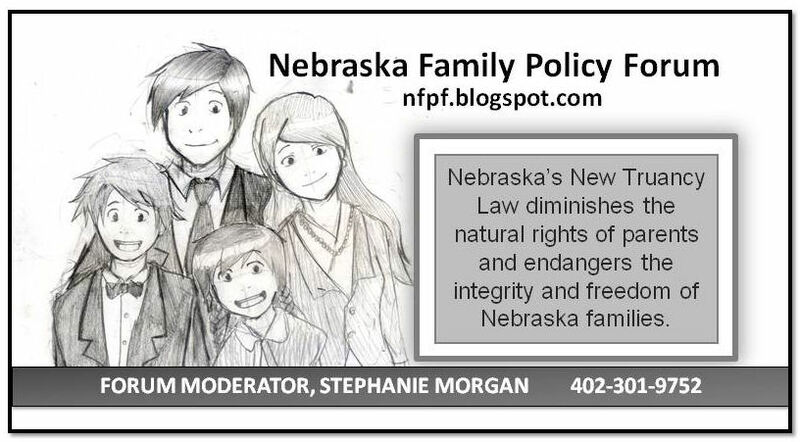 If you haven't found our Facebook Group yet, you are missing the full affect of Nebraska's truancy law on the everyday lives of families. These are some highlights from the discussions at our Facebook Group. Join us on Facebook and become part of the conversation. Recently I was able to directly visit with a medical physician, also a RN. I ask point blank what they thought of this new truancy law. To the best of my knowledge, unable to quote word for word answers, this was the reply. Do to the fact parents are being forced to send their child/children to school even though they are ill, because of the truancy law, enforcement is endangering not only the sick child but other children and school professionals. There are highly contagious diseases/sickness that are air born and will spread quickly and these children are being forced to go to school sick because the law has put fear into parents. It is insanity! Sever medical conditions could result and will result eventually endangering the health/well being of a child. Those that put this law in effect did so without any common sense what so ever when they stipulated no medical excuse would be excused. I should add that the medical portion is only one huge flaw in this truancy law there are other big factors pertaining to this truancy law that will eventually be challenged. Not only are parents angered by this law there are many of us in the medical profession that are also. I did not ask permission to use publically the medical professionals name therefore will not do so. And again the above answer is not a quote as I can’t remember the exact wording of the reply, but to the best of my knowledge was the given reply. When we were looking for schools for our kids last year, the parochial schools were not concerned about the law or any reporting required by it. The public school administrators were very honest about their concerns. One administrator told us that our kids were not welcome in that district if they were going to miss a significant number of days to participate in a national theater production tour. She stated, in writing, that the absences could negatively impact standardized test results and therefore were unacceptable. This is straight from the elementary school nurse for my youngest child's school in Millard. Hmm...are we sending out kids to school sick now because of truancy fears?? See what this nonsense is causing!! The current strain of respiratory flu going around is taking an average of two full weeks to fully recover-not that you can't attend school, but the cough just lingers and kids generally don't cover their cough. NOTE FROM THE NURSE: If your child is ill, please keep him/her out of school. Sending a sick child to school helps to spread the illness to others. Also, if your child vomits during the night, please do not send him/her to school in the morning. In addition, children must be fever free WITHOUT the aid of medication (ie Tylenol, Ibuprofen, etc) to be allowed back into school. Last Spring, the state required all of the staff that works in my department across the state to attend a mandatory meeting. One of the staff (Sudanese placed resident) is a single mother with no family here. So in order for her to keep her job with the Douglas County health department, she had to drive her children to Minnesota (where the nearest family member lives) the Friday before, drive back to Kearney attend the training for the first three days of the work week and then drive back to MN to pick up her children. In total her children lost 6 1/2 days of school and now she has to deal with the social workers who are investigating her as to how long she leaves her children unattended from when school is out to when she gets home from work (and she has one day a week that she has to work until 7:00 p.m.). Unfortunately for her she does not have the resources and is trying to be as compliant as possible. I contacted my son's school to make arrangements to pick him up 15 minutes early tomorrow for an orthodontist appointment. His last hour is a study hall so he would not be missing class, just the last 15 minutes of study hall. I was informed by the secretary that unless I brought a note from the orthodontist to prove my son was there, he would be counted absent and unexcused. Apparently my word isn't good enough and the school is assuming I will be helping my kid join a gang, spray graffiti and generally create havoc between 3:00 and 3:15 tomorrow afternoon. If the schools do not respect parental authority, then why should children respect parental authority. If children do not respect parental authority then why should they respect the rule of law? If the law then becomes unsustainable, aren't we less than a generation from total tyranny, and chaos. The irony is that this law was written to keep youth away from lawless activities? I'm joining your "gang" Brenda. And I'm not going to lie. I will take the children out to play with our family for a birthday party. It is important enough for Dad to take off work. It is important enough to miss 2 hours of school. Emotional bonds and psychological well being weigh far more in making successful adults than academic instruction. So did you all see this story about these AMAZING young people who have been invited to dance in the Macy's Thanksgiving Day Parade. These ladies will be representing Omaha and Nebraska. Only the top dancers and top dance studios in the entire country are invited to participate . I am sure the Governor is proud of them representing our state so well. With that said, you will see during the video, that it is a requirement for the girls to be there a week early. They left yesterday and will be there through next weekend, THUS MISSING BEING IN SCHOOL! Better tell them not to go and to turn down this opportunity of a lifetime since they will not be "learning" since they are not physically IN school. Case Closed! I have another friend who has a daughter who is competing for the state of Nebraska in the national competition for Teen USA. I believe the winner of the competition is offered a college scholarship! The competition is a several day competition in California. They also left Friday and will not be back until next week. The mother is from California, this will be the only trip to CA they will be making this year to see her parents , grandparents, and extended family. THIS is exactly the biggest reason that I am a member of this group! I had many of these kinds of experiences as a student and I want my own children to have the same kind of experiences. I hate the idea that I might have to tell my children "no" to a once in a lifetime opportunity just because the state thinks it's more important that my child be sitting in a sit, staring at a whiteboard. One of our kitties is very sick and likely will not live many more days, in spite of our efforts. My daughter Sydney - who primarily lives in Lincoln and is graduating from Lincoln High this year as a nearly straight-A student in the IB program at age 16 - wanted to come to Omaha tonight to spend some time with Piper (her kitty) before she dies. That means she will be missing school tomorrow, bringing her to 8 days missed: 5 days for her volunteer service trip to Haiti during the first week of school, 2 days from illness, and tomorrow - to help care for and love her beloved Piper. We'll see how the rest of the year goes, but I find it intriguing (and I'm appalled) that we should even have to consider the short-sighted arrogance of Nebraska officials who think they know better about the well-being of my children. 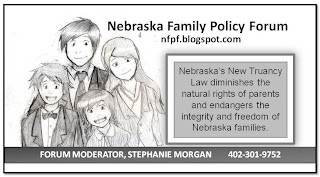 Correction - ... of Nebraska officials who are putting forward a false pretense of caring about the well-being of our children, but who are really attempting to standardize not only our children's education, but our family life - under the law - for their own benefit. I thought this year would be an easy one for us to keep absences down, now that my husbands home from Iraq, but life is unpredictable. My mother-in-law has just been diagnosed with Pancreatic Cancer, and because of her health we are already having to plan absences in the near future. I got my son's report card in the mail. It just bugs me how this is formatted now. Student attendance is at the top of the sheet, the first thing that they list, and they count every hour a child misses rather than the number of days so it's kind of tricky to figure out. My son has been absent 6 days so far this year, that means via our school district policy he is an excessively absent student! Below the attendance summary is the Grade report. My excessively absent student has 8 A's and 2 B's. I wonder which they care about more, his attendance record or his grade record? With my son already at 6 absences because of illness and orthodontic work, I have no idea how this year will go, and after last year they very likely could determine that his "pattern" is a sign of "problematic" absenteeism and turn us in to the GOALS team. I talked to Jennifer Chambers, a few nights ago at a church activity, her family is in the court system in Sarpy county because of this law. She was saying that this year, in order to keep her daughter who is often ill from reaching the 20 day threshold, they are having her send her daughter to school sick and they are keeping her daughter in a sick room. This way they can count her present, but she can rest. What is wrong with this picture? I attended one of the court dates for this very cute 11 year old girl. She was shy and sweet and when the attorney told her they would put her on probation she broke down and cried. She said to her mom, "What did I do wrong!" Her mother told me later that this process had changed her personality. That they had made her feel like a criminal and she had begun to doubt herself wondering it maybe she was a bad kid. I will begin homeschooling my youngest daughter in Jan. because of this law. The decision to homeschool our youngest is a personal one and we will still have one in the high school who has mixed feelings on homeschooling hence I will not pull her. I am taking a chance that with 6 absences she wont be sick. I feel this law was poorly thought out and continue to write to Gov Heinemann about the implications of it and educate everyone I know on exactly what they can do when they become entrapped in the nightmare that so many have experienced. I will be downtown at the board meeting later this month and I am hoping and saying many prayers that we have support on the board . I have lived in Nebraska most of my life, except for my military service and I always thought Ne had a top rated educational system. In my eyes it has deteriorated so much that I feel if we don't stop and get it back on track then it will be lost . What a shame for all the kids in the state. And what's really sad is that all these kids pay the price because our elected officials who are in office to serve US are too busy chasing federal dollars to worry about what's right for the children and the state. I spoke to the school admin. about her comment, and was told that we should think about "regular" hours jobs, so we could both be home in the evenings. I asked if they felt this was the reason, my son was having trouble understanding his math. Their answer was, it was our fault because of our strange working hours. I asked if they would consider my family "dysfunctional"? I was told that good grades start at home! No joke!!!! My son just made graduation! Enlisted in the Army. Has been promoted three times in 5 years, served 15 months in Iraq, and 12 months in Afghanistan, and has obtained a BA. Makes one wonder how he could learn at all while serving in a combat unit, yet could not learn because we worked "shifts". Not hard to see why public education is having so much trouble!! My daughter, who is an A+/A student, just had a Petition filed against her by the Sarpy County Attorney for missing 5 days this year (after missing 20 last year). Now I have to take her to court next month, which means more school missed for her and work for me. Doesn't that defeat the purpose? This law is absolutely ridiculous! There has to be a better way to go after the children who are truly truant!! Her hearing is on December 13th. I still don't understand the Petition because it says she missed 20+ days in the 2011-2012 school year (this year), which is not true. She missed 20 days LAST school year and 5 days this year. Her court-appointed attorney was supposed to find out a week and a half ago and call me, but I haven't heard from her, nor has she answered my email or phone call. Dawn, your frustration with the process is shared by many who are currently experiencing the same thing. The law has sorted thousands through the system and the court appointed attorney's are swamped, even more than usual, which makes them pretty useless. Another parent I talked to a few days ago said they are on their 6th court date, their public defender has nothing, and they have spent countless hours and money compiling all their records and information to defend themselves. *Dawn's case was dropped not long after this posting. My son is attending MSHS (Millard South High School). I hate it! I'm a single mom whose son gets great grades, and stays out of trouble. A student burst his eardrum so he missed a few days. The school has done nothing about this "clap" game! To me his absence shouldn't count since it happened on there watch! I'm terrified. What if he gets pneumonia or injures himself? Then what? I'm so scared I'll lose my greatest gift! My son. I just don't understand. I'm a single mom doing her best! I have a wonderful son! Why should these kinds of absences count as "truant" behavior? Liz, that is outrageous! Your story is just another example of what is wrong with this law, and our education system. I read a story recently about what causes truancy (or attendance issues) and the author said, "Most truancy programs -- both the innovative and the ordinary -- have two factors in common: They identify the family as the primary source of a student's truancy problem and operate on the assumption that the sole effective solution to truancy lies outside the school." Our state plan to address school attendance makes the assumption that Nebraska's failing students, fail because they miss too much school and that their families are the primary cause of their "truancy". This story and many other studies I have read contradict these assumptions. According to a survey reported in Student Truancy, "students most often cited boredom and loss of interest in school, irrelevant courses, suspensions, problems with peers, and bad relationships with teachers as the major factors in their decision to skip school." Other studies indicate that habitual truants are struggling academically, do not have friends who attend school regularly, see no reason for attending school, and report feeling socially isolated in school. Most commonly, from the student's perspective, the immediate cause of truancy lies within the school. It is highly likely that the school is the problem, the cause, of excessive absenteeism. I'm not saying that in some cases the family contributes, but as Liz's example demonstrates, there are many families who are stuck in failing schools because of circumstance and the fact that there kids haven't given up on the whole thing is largely because they have excellent parents who push them forward against extraordinary odds. Despite the belief among most educators that family problems cause chronic truancy, the fact is that schools are responsible to provide a safe quality educational environment that motivates and engages the student, and the school can be expected to deal with many of the issues that cause truancy -- even in the face of indifferent or ineffective parenting. On a positive note, our children came out of school this afternoon to celebrate a family birthday. I talked in advance with the Attendance Vice President, the children requested their assignments a day ahead of time, and turned any work due in before leaving school. I told the complete truth about where and why we would be missing school. The Attendance officer appreciated our honesty, the fact that parents were aware of all the subjects being missed and parents were planning to have missed work done before leaving. Nevertheless he will count it as an unexcused absence. So be it. My children are not behind in any subjects and are good students. Responsible parenting requires that parents do what is necessary for students to do their best academically. Many educators realize that means parents need to take children out of the classroom. The family bonding and emotional security yield far greater dividends than just keeping a seat warm at school. Parents need to give the "I care" time because children naturally want to please their parents and do their best. No Child Left Behind and Race to the Top have done more destroy good education than render any aid to our children. My mother became very I'll while visiting my sister in NY and was hospitalized with seizures of unknown causes. I had to relieve my sister. I made the decision to take my son as his father works 12-hour shifts and I have no other family here in NE. Though my son is on the honor roll and up until then had NO history of absences I still had to deal with this aggravation. My fear is that if my mother becomes ill again and I have to go to her home in the Caribbean, the Millard school district policy is that they will no longer give you the work to take with you, but pressure the child to make up the work plus keep up upon return. So I have to choose between my only parent and my only child.